7 Colour Correcting Palettes And Products To Conceal Every Skin Woe! Uneven skin tone and pigmentation is where an amazing make-up look might fail sometimes. Understanding what needs to be cancelled out and what needs to be highlighted is the secret to notching up your make-up game. That’s where colour correcting comes in, it isn’t rocket science but there definitely is a formula. Here a list of what each colour does for you to help you cover up everything from dark circles to red acne scars. Green cancels out the redness. Purple cancels out yellow tints. Pink cancels brown which is perfect for dark circles and pigmentation. Orange cancels out the blue which is amazing if you have prominent veins under your eyes or on your eyelids. Peach also cancels out blue which is ideal for the rest of your face where you might have veins. Yellow cancels out redness and works well if you are tanned or have a naturally sunkissed tint. 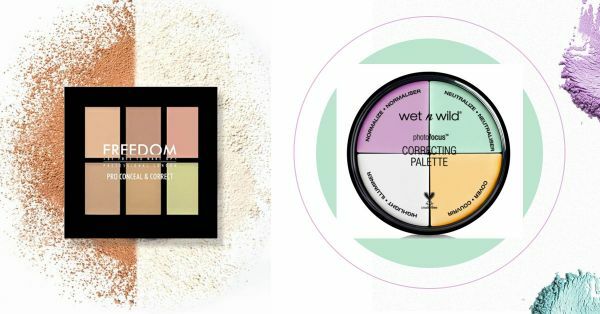 Now that we know what each colour does, here are a few of our favourite colour correctors and palettes for every budget! This palette has all the essentials to cover, highlight, normalize and neutralize. This quad-set is to be used under foundation to even out skin tones. The purple is great for under-eye circles as it cancels out the yellow undertones and brightens up that area too. Remember to use a concealer over it for a colour perfect match. If you don’t need a whole lot of product for your skin it’s probably best to use a colour correcting primer. Not only will it help improve the texture of your skin but it will also correct those areas that need help. It’s available in 3 colours, yellow, pink and green, so choose the one best suited for the problem you need to tackle the most. We particularly like this palette because it is available for different skin tones and needs. There are six creamy colours that blend in to give you smooth and clear looking skin. This primer by Smashbox comes in two shades green and pink and is great for lighter skin tones that have a red undertone. These two shades help correct red pigmentation and give you clearer looking skin. This product is also great to use on those days that you don’t have time for a full face of makeup as it does offer mild coverage. Freedom Pro’s conceal palette also has colour correction shades to target pigmentation. Plus, these palettes are available in 3 variants for light, medium and darker skin tones, which makes it suitable for everyone. If you don’t need too many palettes then try using these colour correcting sticks that aim to help different skin issues from dullness, to redness and pigmentation. What we personally love is the control of application because it looks like a pencil! Okay, this isn’t a palette but we had to include something for our lazy girls! When it comes to quick colour correcting, a CC cream is often a girl’s best friend. This one by Lakme comes in two shades for darker and lighter skin tones. Wear it as is, or use it as a primer to give maximum coverage and an even skin tone. Do away with those blemishes now!